Above a screen shot taken from the BBC reporting on the German terrorist Ali David Sonboly. 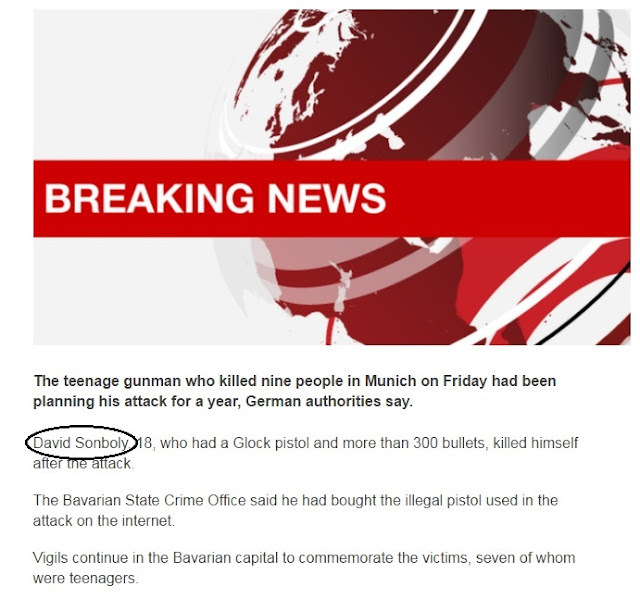 Most sources at this point suggest that Ali David Sonboly – the Munich attacker who targeted children and killed nine this weekend – was not connected to radical Islam, but the BBC has gone to extraordinary lengths to try to keep any reference to his heritage out of its coverage, opting to name him only as “David Sonboly”. Other media outlets have have blamed the killings on Ali's obsession with guns, his mental and psychological health, the relaxed gun laws in Germany, that Ali killed his victim's in revenge of bullying and he even copied far right, mass-murderer Anders Breivik, who gunned down 77 people in Norway last July. The length the media is trying to hide the fact that Ali had a Muslim or Islamic heritage borders on disbelief. We hear the phrase, Islam is the “religion of peace” mentioned in the mainstream news media and even the leader of the free world, but Islam is not a religion of peace, it is a religion of demonic hate and murder and Ali came from a Muslim background and these attacks will increase in Europe because the European leaders fell over themselves allowing millions of refugees to enter without checking their background and allowing probably thousands of terrorists into our midst. Well Mr. Walton, you should stick to reporting on natural events. Your insight is laughable. This is most certainly not " is another terrorist attack in the name of Islam" and you have lost all credibility with me.